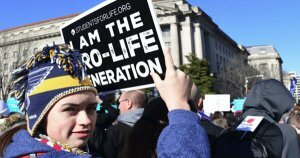 THANK GOD: 70 PERCENT OF MILLENNIALS SUPPORT LIMITS ON ABORTION! Lord, this battle for the lives of our youth has been waged for a long time in our nation. We ask for effective strategies to combat the forces of darkness that are killing our unborn. The poll, conducted by pollster the polling company, inc./WomanTrend for SFLA’s Institute for Pro-Life Advancement, asked 18-34-year-olds during the first week of January about their attitudes toward Roe v. Wade and America’s current abortion policies…. The poll found that, while 56 percent of American millennials – now the largest voting bloc in the country – are political Independents, 65 percent want to vote on abortion policy, compared to only 16 percent who want abortion to remain in the hands of the courts, and 19 percent who are unsure. According to the poll, 20 percent of millennials identify themselves as Republicans and an equal percentage as Democrats…. Additionally, only seven percent of millennials polled supported abortion without any exceptions and funded by tax dollars – the position embraced by the Democrat Party. “Our poll found that Millennials do not blindly support unlimited abortion paid for with their tax dollars, no matter what the popular culture says,” said Hawkins…. Regarding taxpayer funding for abortion, 45 percent of Millennials polled opposed it, with 33 percent supporting it, and 22 percent undecided…. With about a third of abortions now induced by drugs like RU-486, 56 percent of Millennials surveyed opposed selling the abortion drugs online or dropping the requirement for a physical exam due to the potential risks to women. Regarding Planned Parenthood, 41 percent of Millennials polled had an unfavorable reaction to the abortion vendor after learning about the organization’s political spending in the millions to elect pro-abortion candidates, as well as its more than $1 billion in income, about half of which is derived from American taxpayers. In addition, 43 percent of those surveyed had an unfavorable reaction to Planned Parenthood when they examined the organization’s decline in basic healthcare services as seen in its own annual report…. “On the issue of abortion, labels like pro-life, pro-choice, access, health, or women’s rights often camouflage the true realities of the policies that today crisscross the country,” she said…. I was delighted to read about the millennials and their support for a limit on abortions. I believe that this results is an answer to our prayers in that it is a large part of the collective praying for an awakening in our land. Praise be to Almighty God for His faithfulness!!!! Hallelujah! My son is a millennial and has been telling me this is how people his age feel, but I thought they were in the minority. Next time it comes up, I can agree with him!